A Middle Eastern pantry essential, tahini is the foundation for many Middle Eastern recipes, including like baba ganoush and, most notably, hummus—though its uses extend far beyond just those two common recipes. Although you can buy premade tahini at a number of grocery stores—though, in some areas, you might have to visit a Middle Eastern grocer—it can be pricey. Additionally, jarred tahini doesn't always taste as good because it's been sitting on the shelf for such a long time. It might taste bitter, astringent, or even slightly acidic and have a chalky mouthfeel. Good tahini, on the other hand, tastes slightly nutty, savory, and has a creamy texture. Luckily, tahini is incredibly easy to make at home. Additionally, if you're able to find sesame seeds in bulk bins, which is often the case at an ethnic market or a natural foods store, making your own tahini is inexpensive. If the grocer has various types of sesame seeds—hulled, unhulled, sprouted, toasted, etc.—try out a variety of them for different flavors, colors, and textures in your tahini. The process of blending the seeds will take just 5 minutes, and then you can use this homemade tahini in your own hummus recipe or whip up a tahini-based sauce for a Middle Eastern dish. Preheat oven to 350 degrees Fahrenheit. Toast sesame seeds for 5 to 10 minutes, tossing the seeds frequently with a spatula. Do not allow to brown or burn. Remove the seeds from the oven, and let them cool for 20 minutes. You can also toast the seeds in a dry skillet over medium heat. Stir the seeds frequently until they are lightly colored but not brown, or about 5 minutes. Transfer the toasted seeds to a tray and let them cool completely. Pour sesame seeds into the food processor. Slowly drizzle in the oil while the processor is running, blending for 2 minutes. Check for consistency. The goal is a thick, yet pourable texture. Add more oil and blend until desired consistency. Toasting the sesame seeds isn't strictly necessary. However, tahini made with untoasted seeds won't be quite as nutty, and it might have a slightly bitter flavor. If you don't have a food processor or blender, crush the seeds with a mortar and pestle. It will take more work and might result in a less-creamy texture. Tahini will keep in a refrigerator for up to three months if it's stored properly in an airtight container. Make an Asian-style black sesame paste by procuring black sesame seeds for your tahini. 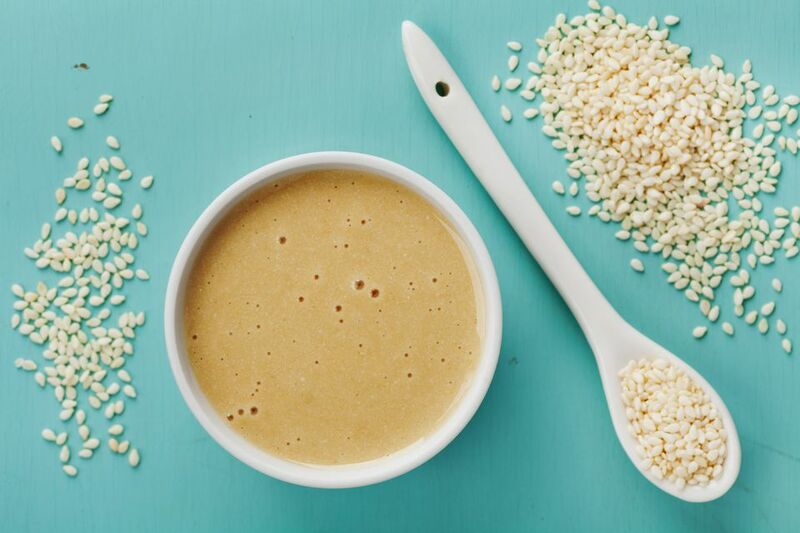 Use unhulled sesame seeds for richer-tasting tahini with more nutrients. Tahini can be made without any extra oil if you're looking to cut down on the grams of fat in the final product. However, the tahini will not be as creamy and will take longer to grind down to a paste.